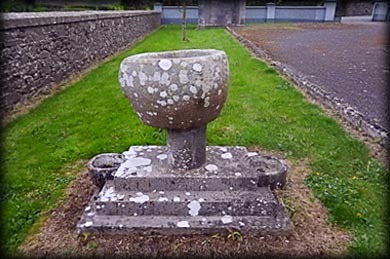 This is one of the many medieval fonts to be found in County Meath. It is situated on the southside of the Church of the Assumption in Newcastle, Moynalty. The external diameter measures 0.66 metres and narrows towards the bottom. There are four vertical lugs on the sides, these are not noticeable at first glance, they can easily seen in the image left. 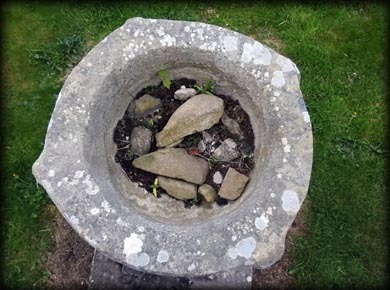 Sadly the basin, which had a central drain-hole, is filled with soil and stones. The circular font is ponderously balanced on a round pillar in the centre of a stepped base. I really love this quirky looking font, the fact that it is not perfectly symmetrical makes it quite attractive. Situated: From Moynalty travel northwest on the R194 for 350 metres then take a slight left after the cemetery. After 6.2 kilometres you will see the church on your right. Discovery Map 35. N 7026 8867. Last visit Apr 2017.